In my book, scones are pure comfort food, like a warm hug that envelopes body and spirit — especially on chilly spring mornings when winter seems to be hanging on for dear life. 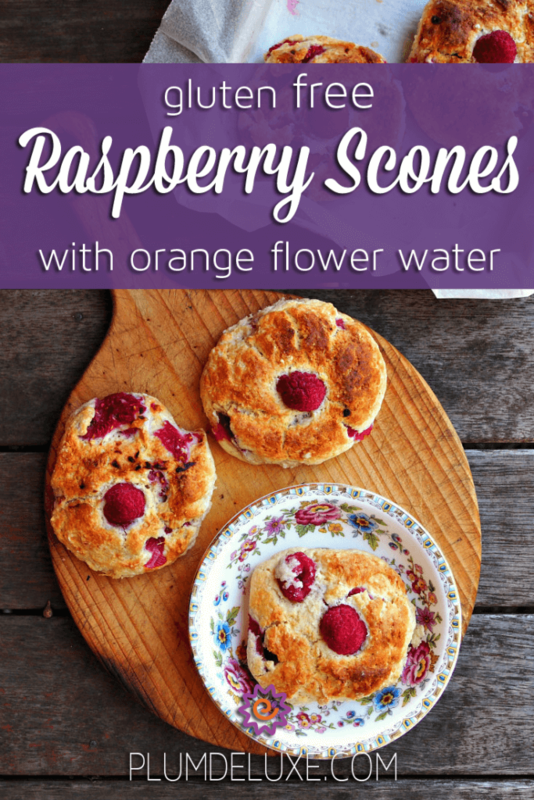 These gluten free raspberry scones with orange flower water are truly delightful for such moments. With tart raspberries lending a fruity zing and orange flower water bringing a heavenly fragrance, they are deliciousness personified, giving a hint of warm spring days to come. These gluten free raspberry scones with orange flower water are not overly sweet, so they’re especially scrumptious when served warm with salted butter and a smear of raw honey or raspberry jam. That extra kick of sweetness really brightens the flavors and takes the edge off the tart raspberries. If you happen to have leftovers, these scones are just as nice the next day after a light toasting in the oven. 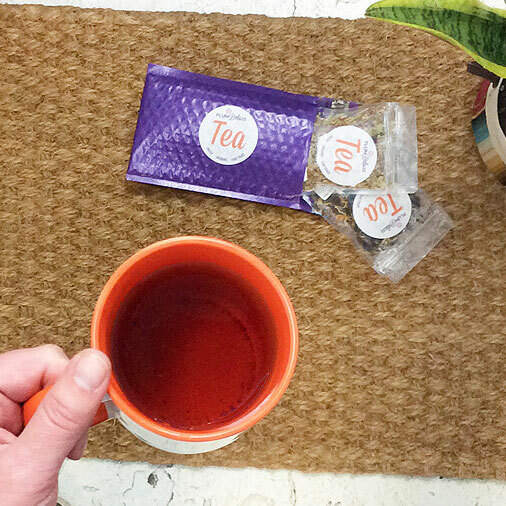 They pair perfectly with a cup of Raspberry Revitalizer Mate to brighten your day. Gluten free baking can be tricky, often resulting in a scone that is flat and gritty. For my gluten free baking, I like to use the gluten free multi-purpose flour mix by King Arthur. There is none of the grittiness, and the rise is quite lovely. If you fancy making your own blend, they provide a recipe for a brown rice flour blend that is a decent substitute, and I’ve included it below. Whisk all ingredients together. Store in an airtight container at room temperature. 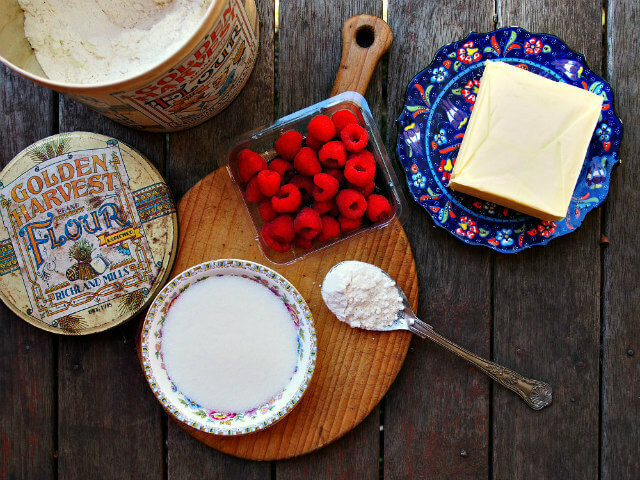 For truly beautiful and delicious scones, fresh raspberries are essential. 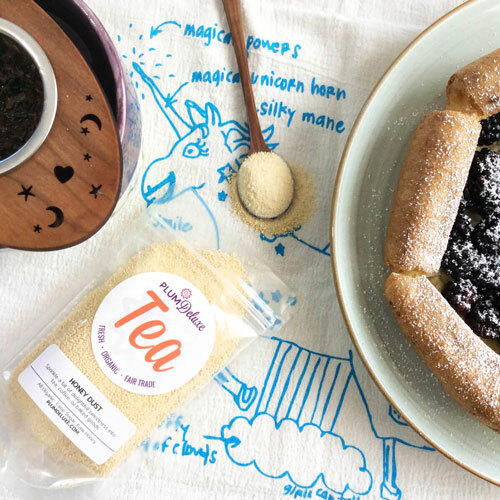 Not only is their flavor wonderful and tartness sublime, but they also hold their shape beautifully in the baking process and look absolutely stunning popping up out of the finished scones. If you don’t have access to fresh raspberries, frozen ones work well too. They are just as tasty, but they will bleed quite a bit when you mix them into the dough, providing a rather pretty swirl effect through the scone. They won’t pop out quite so much while baking, but will have a nice, rustic look when finished. Orange flower water can be purchased in grocery stores or shops specializing in Middle Eastern food supplies, or you can purchase it online and have it delivered straight to your door. If you have access to orange flower petals, you can easily make your own. Collect 3-4 cups of fresh orange flower petals, preferably from Seville orange trees. Clean them thoroughly, then place them in a mortar and pestle and crush them into a rough paste; set aside for a couple of hours. After the rest, scrape the petals into a sterilized glass jar, then cover with distilled water. Set on the window sill or outside for a couple of weeks. Smell the infusion. If it’s too weak, leave it for another week, then strain and bottle the liquid in sterilized jars. Once your dough is mixed, it will be quite wet and sloppy. Scoop it with a spoon and top each mound with a fresh raspberry. Brush each scone with a bit of whole milk to aid browning, and bake for 15-20 minutes. In large mixing bowl, stir together flour, sugar, baking powder, xanthan gum, and salt. Cut in butter until mixture resembles small crumbs. In small bowl, whisk together eggs, milk, and orange flower water. Add to flour mixture and stir until incorporated. Mixture will be wet and sticky. Using large spoon, scoop dough onto baking sheet covered with baking paper. 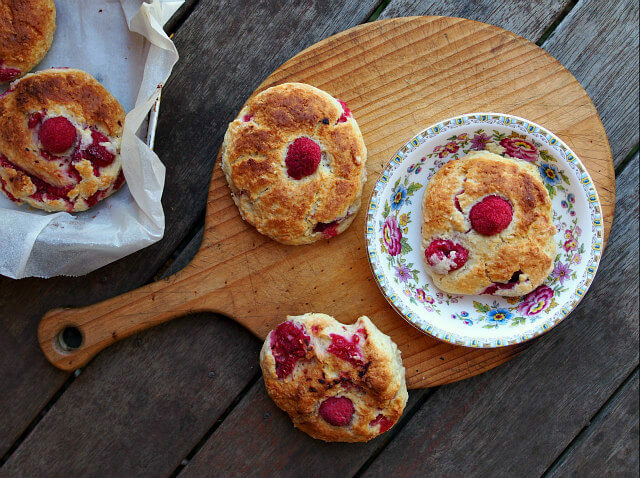 Top each scone with a fresh raspberry and bake for 15-20 minutes, until tops are golden brown. Serve warm with butter and honey or jam. 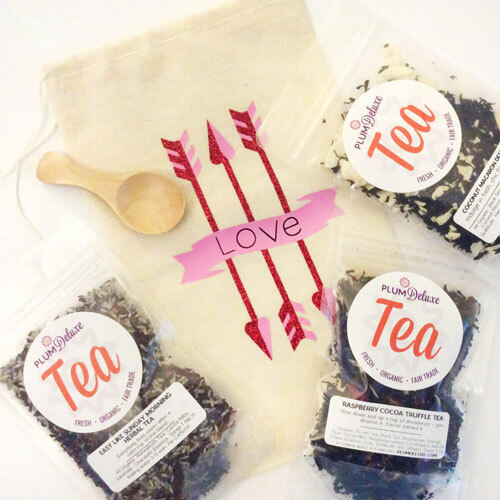 Want more gluten free scones? 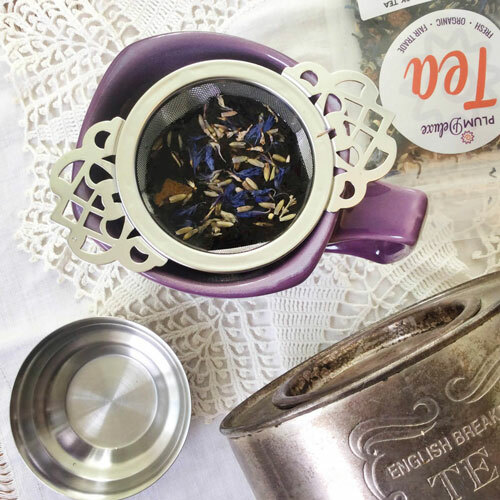 Try these blueberry and rosemary Meadow Walk Scones or these gluten free, dairy free grainless scones.